Welcome everyone to our latest challenge and happy Mayday to you all! To celebrate Spring (at least here in the Northern Hemisphere), I have chosen Spring Colours for our theme. 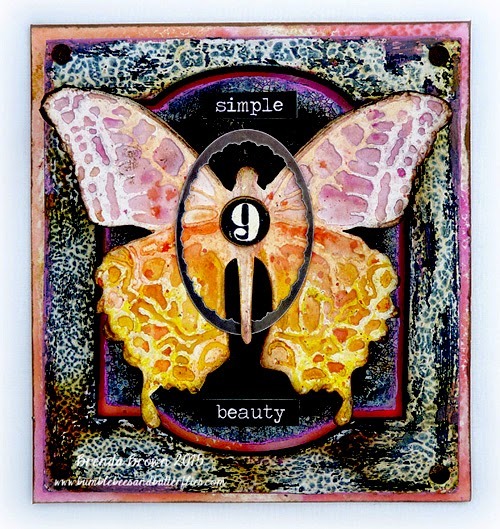 The theme itself of course is fairly easy, but it is important to remember that this is a Tim Holtz inspired challenge, so when choosing our top 3 entries, we want to see Tim's influence clearly represented in your project. If you describe it in your post even better! You do not have to use Tim products, though his wonderful Distress range of course offers plenty of choice, but we do want to see that your project is inspired by one of his wonderful techniques that he so freely shares. The colours for my Spring palette butterfly were chosen when I was looking out of the window at the blossoms and flowers in the garden. 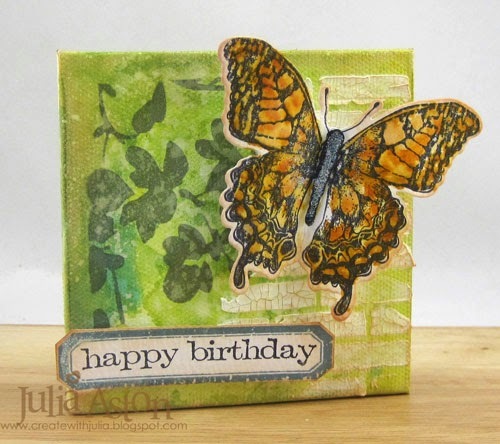 I have used Tim's layered butterfly and cameo frame dies and a mixed media technique using oil pastels and distress stains to create the mottled effects on the butterfly wings. 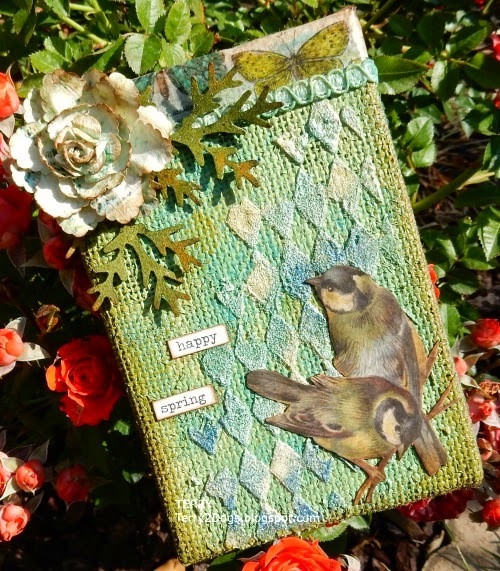 I know I'm dating myself with this term but couldn't resist using Tim's Bird Crazy Stamp Set for this canvas. Some of us remember sharing a "party line" with our neighbors. 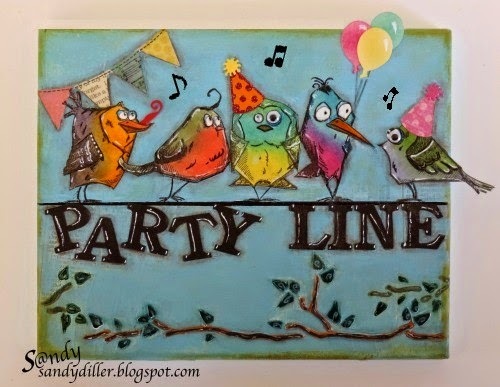 I hope you enjoy my combination of this colourful theme with party birds on a wire. For more photos and details please stop by my blog My "Crafty" Life On The Internet. For me, spring is full of vivid greens, the fresh blue of the sky (so uplifting after the grim greys of winter) and the delicate white of blossom; and I just love the dappled look of sunlight through the new growth of the re-awakening trees. 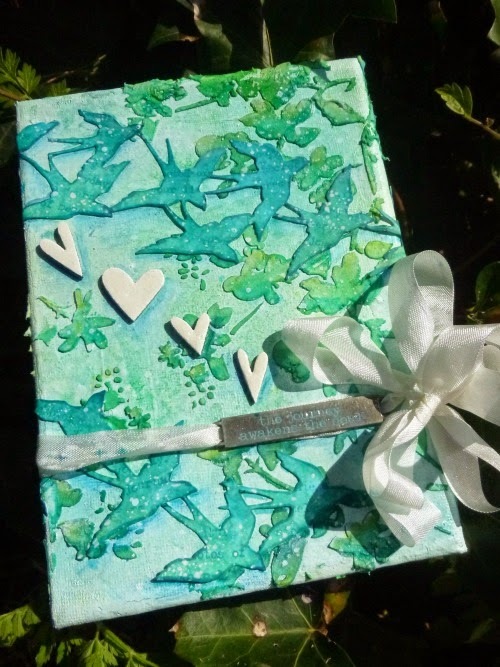 I've tried to capture some of that on my small canvas using texture paste, die-cuts, lots of Distress Sprays, glossy embossing, as well as inky shading and splatter. Do come over to Words and Pictures if you'd like to see more. I always know that Spring has arrived when the beautiful Star Magnolia in our garden bursts open it's buds into the most glorious display of flowers. 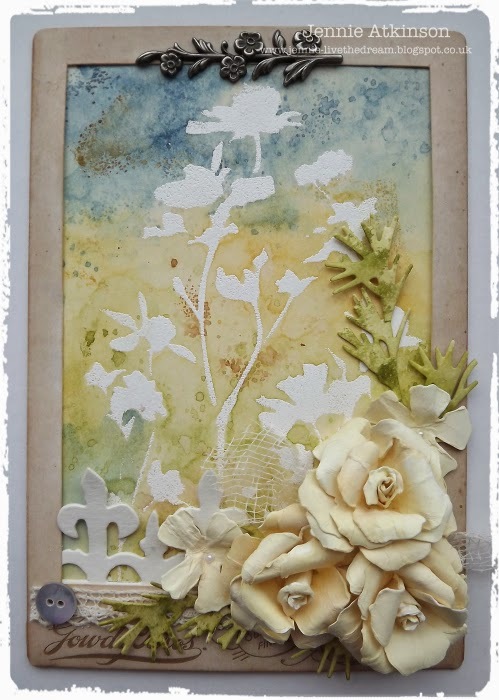 I have tried to emulate the flowers using Tim's Tattered Florals die and using the beautiful Spring colours of Cracked Pistachio and Abandoned Coral on my box. You can see more on my blog here. Astrid's choice of Spring Colors brings to my mind the wonderful birds that come out to play in my yard, along with the butterflies and lovely flowers! 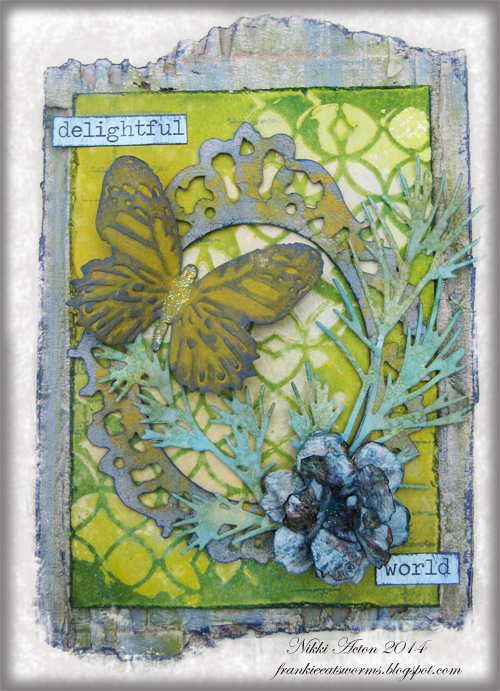 I decided to alter a burlap panel using a variety of products by Tim Holtz. For more details, please stop on over HERE. What I love about spring here in Shetland are the light nights and the dramatic change in the colours of the sky, sea, sand and hills after the winter gloom. With these colours in mind I decided to alter a Cabinet Card Frame using Distress Inks and Wrinkle Free Distress Techniques and of course flowers made using the Tattered Florals Die. Please hop on over to my blog if you want to know more. 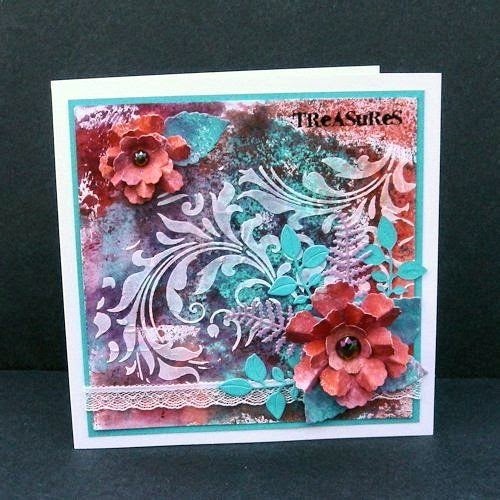 Spring colours and a spring theme for me this time using a number of Tim Holtz dies and plenty of inky and painty fun. 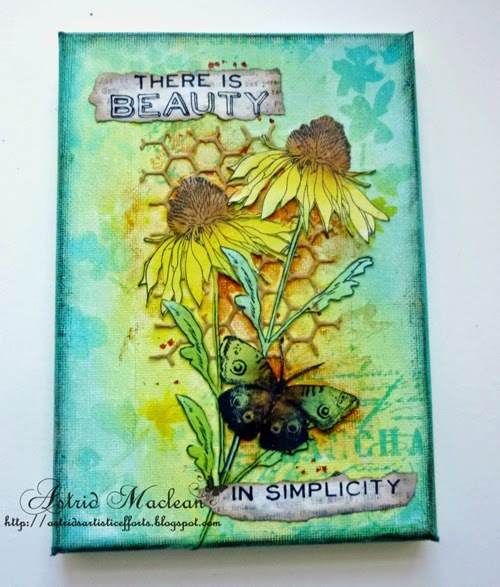 I set my little piece on some painted corrugated card to create a shabby feel. Be great to see you over at Addicted to Art where I will share the details today. For me Spring Colours are bright colours from Daffodils, Tulip, Crocuses and Berries to name a few. A super challenge which took me out of my comfort zone of a soft muted palette. 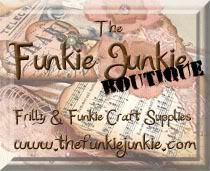 Love to have you pop over HERE to Juliz Design Post to see my project in detail. To me the Spring is about the blossoming flowers and soft mellow sunshine that breaks through with its soft warmth and not yet intense heat and colour of the summer. 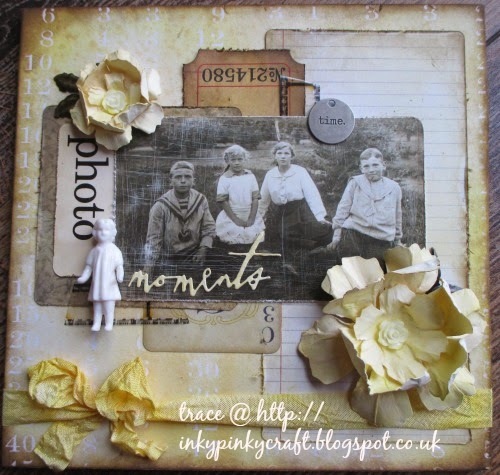 So I created this piece using very unusually for me yellow, plenty of idea-ology and another of those gorgeous photo booth images.All the detail can be found on my blog here. Well, I'm sure you'll agree with me, with 12 creative guides having contributed, there is plenty of inspiration here, and of course we hope you will decide to play along. Just as a little reminder, our challenge is now a monthly one and one randomly chosen winner will receive a £20 gift voucher from our very generous sponsor, Country View Crafts. 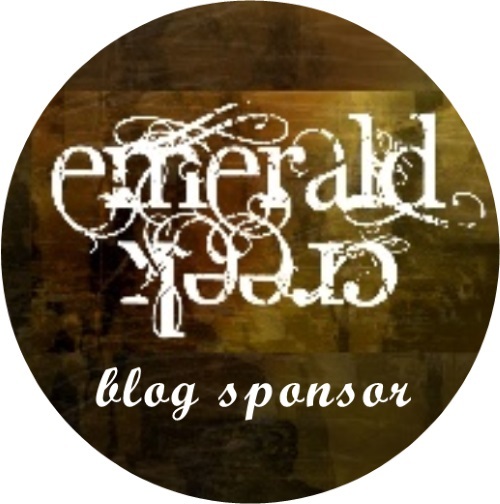 We will continue to have our Pinworthy blog badges for the Top 3, who will be chosen by the Creative Guides (DT). You have until May 31st at 6:00 pm GMT to link up your creation! Gorgeous projects ladies! Love the spring inspired art! Absolutely happy, chirpy springy projects from all you! So inspiring and so many techniques. Great start for the month. So many lovely interpretations of Spring here - they lift my spirits just looking at them all! What a great inspiration from the super talented Creative Guides! Stunning creations, ladies with lots of amazing techniques! The theme for this month is perfect! Thanks for the inspiration, Ladies! Hope all these Spring colours will push out the rainy days...! Wow! So much beautiful inspiration! What a super challenge Astrid and such an array of inspirational projects from everyone. Great job from the team as usual - Loving those spring colours. What a wonderful theme and amazing inspirations from the creative guides! Can't wait to see what everyone creates. Such inspiring and Stunning pieces everyone!!! 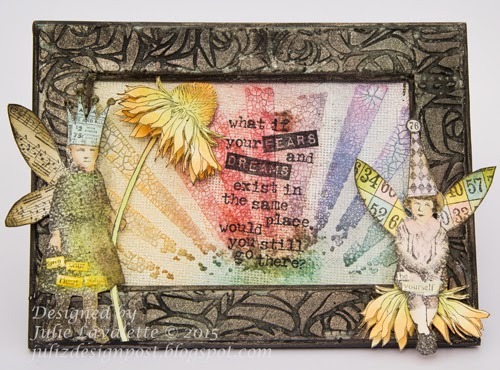 Gorgeousness all over with all of those colors and fabulous designs! Thanks so much for sharing- looking forward to playing! Such lovely creations... Sorry to be slow, but I'm gradually making my way round to see them all in detail and having a wonderful time on the way! Oh I am back from a mini vacation and just love all the bursting DT Spring Colors! Wonderful and beautiful projects! Hugs! Beautiful theme and wonderful inspirations!! I feel very proud to be entering this one. 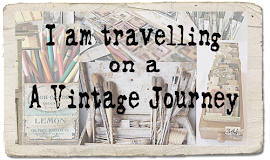 I don't do vintage or shabby chic and I have amazed myself that I have carried it off. Grins. There are so many wonderful projects! I am inspired by all of them!